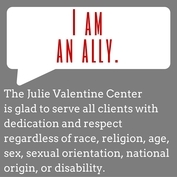 Confidentiality is essential to effective support services for survivors of sexual violence and child abuse, and Julie Valentine Center protects the confidentiality of all of its clients. If the Julie Valentine Center receives a court order requiring disclosure. If the abuse occurred when the client was a child but the client is now an adult, the information is kept completely confidential and the decision to report or not report is completely the client’s decision. Clients who are children: The Julie Valentine Center will report any abuse or neglect of a child. In cases involving abuse or neglect of children, Julie Valentine Center will share information with DSS, law enforcement and other members of a multi-disciplinary team as permitted by state law.